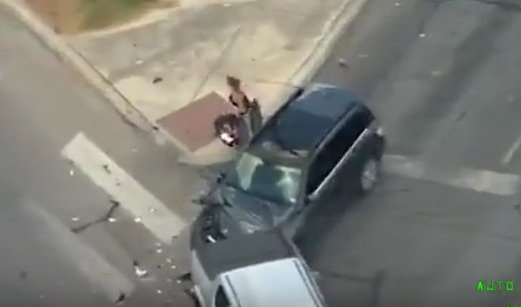 A video has been released showing a Texas mother and her baby leading police on a high-speed chase which took place in June. 29-year-old Caitlyn Rodriguez was being pursued by police near San Antonio. The chase began because Rodriquez knew she had outstanding warrants and tried to get away from the police in her vehicle. At one point during the chase, Rodriquez even ran over a spiked strip causing her to crash her SUV into the back of a parked truck. After crashing into the truck, Rodriquez got out and opened the back door to pull her baby out of the car seat. Rodriguez then traveled across several lanes of busy traffic until she got to a car which she tried to hijack from the driver. Police were in close pursuit and caught up to her before she could hijack the vehicle. Rodriguez has now been charged with child endangerment, evading arrest as well as possession of a controlled substance.